This port has been produced by Rozès’ winemaker Manuel Henrique and consultant Wouter Pienaar. The grapes for the port (Touriga Nacional, Touriga Franca, Tinta Roriz, Tinto Cão and Tinta Barroca) come from the old vines, which were on the quinta’s vineyards, when the present owner took over the quinta. This unique Port, the first 10 years old Tawny of Quinta do Pégo, is 100% made of grapes from the outstanding harvest 2007. It was originally approved as a Vintage Port although this portion was never bottled as such. Instead it was patiently kept in Pipas – the traditional Portuguese wood casks – for a decade. As some things improve with time, this port, which started as a wine of great concentration, structure and finesse, was kept in the silence and darkness of the cellar to slowly metamorphose into this rare preciousness of a Tawny Port. Such alchemy is possible thanks to the wisdom and mastery of the winemakers, patient enough to let the wine evolve through the oxidative ageing process, into this deep and complex harmony of aromas and elegance. Unlike other Tawnies, this is neither a blend of various years nor a blend of a Tawny character. This unique Tawny is the pure expression of 2007, a transcendent year in the Douro, where Mother Nature was exceptionally kind with the vines. 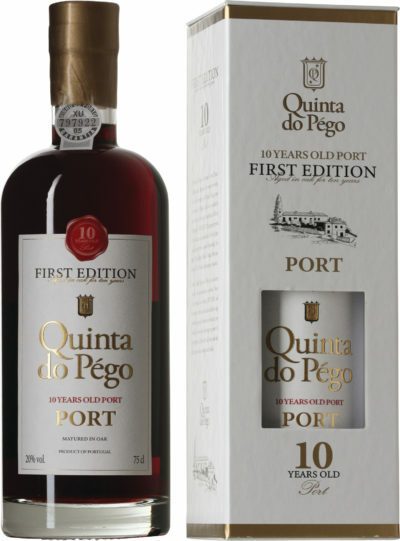 Take time to admire the brown and orange hues of this distinct wine; let your senses indulge in its great finesse, concentration and balance – three important elements of this very unique style, the style of Quinta do Pégo. Only 7,442 bottles made, each individually numbered. This port ought to be served chilled and is perfect as an ”after-dinner-drink” or together with cheese, chocolate and desserts, but it is also perfect on its own.